It’s a Le Mans start: the boats are lined up with each skipper sitting in her boat and her helper (Goldwin in my case)standing in the water next to the boat and holding it in place. The starting horn sounded and off we went. 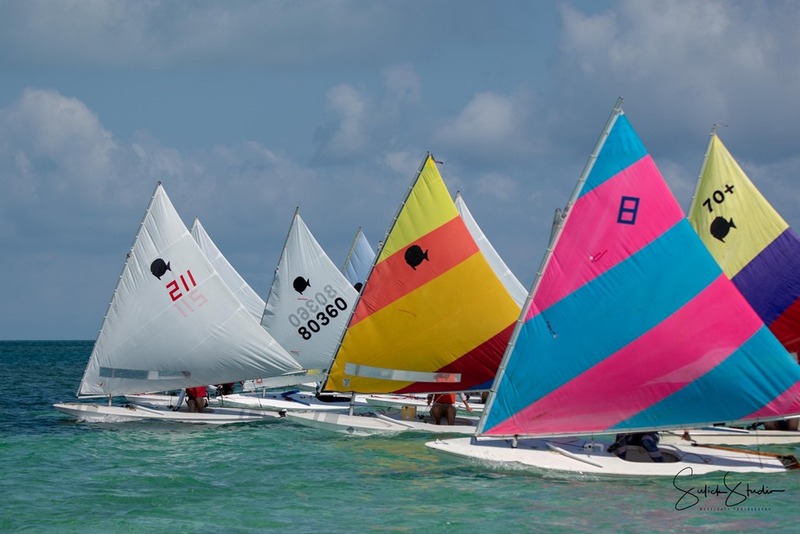 I’m in the boat with the yellow and orange/red sail. 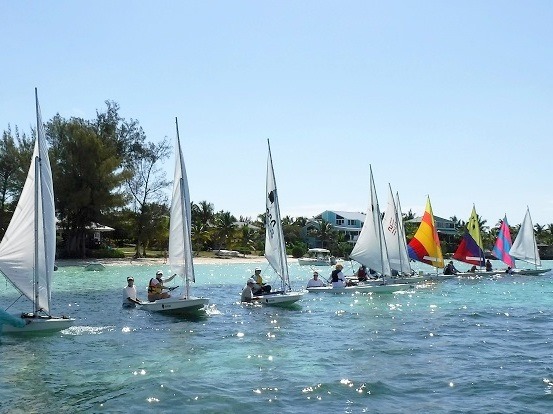 I was in 3rd place all the way to the turning point at the end of the Parrot Cays. Yeah! The next leg did not go quite as well for me and I was in 4th place at the beginning of the downwind leg – still doing pretty well. 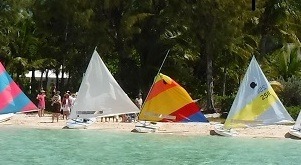 Halfway between the Parrots and the beach, the line holding my sail up failed and the boat flipped over. But I was able to right the boat: first untangle myself and swim around to the bottom side of the boat, now lying on its side, crawl up to reach the centerboard and slowly but surely pull it so it’s sticking all the way out of the bottom of the boat (now on its side). Then put my weight on the centerboard (sticking out perpendicular to the boat), and pull until the boat flips upright. Once I’d clambered back onto the boat and grabbed the tiller and mainsail sheet, I was sailing again. In my now disabled boat – with only part of my sail up. Below – it’s the colorful broken one. 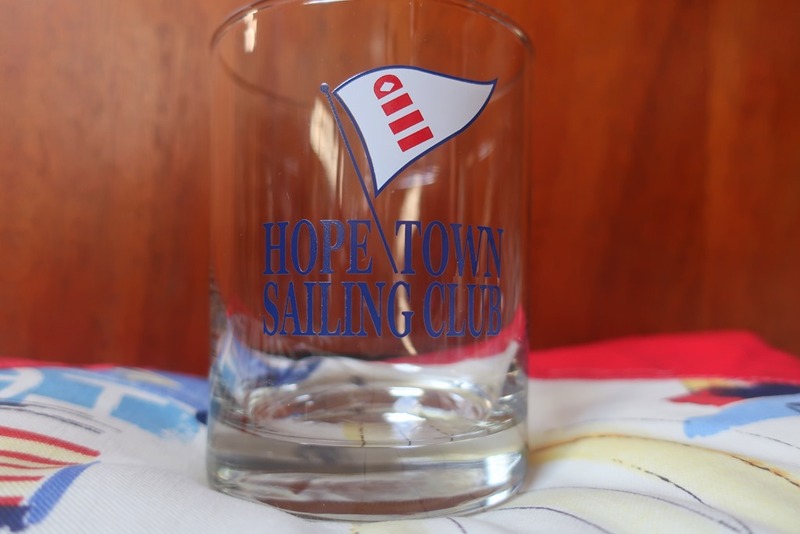 A beautiful Hope Town Sailing Club glass. Which I will treasure (if I don’t break it before I get it home.) Here we are after the race. Big smiles all ‘round. 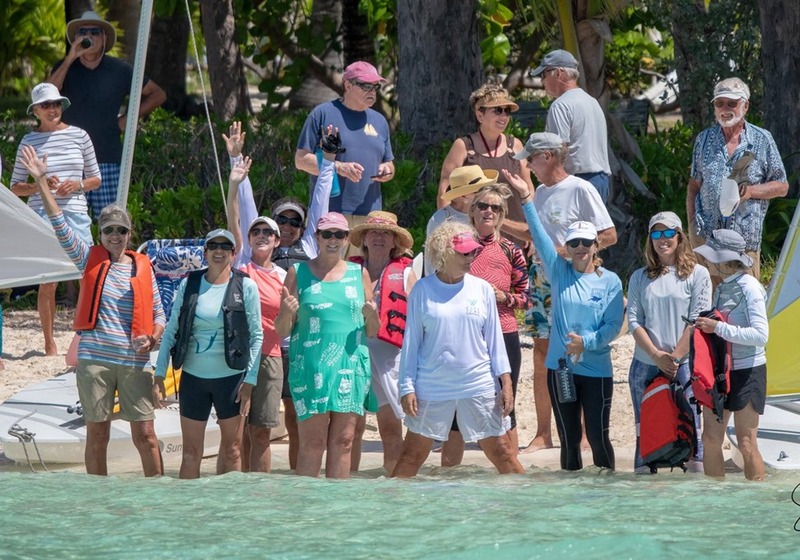 I’m in a bright orange lifejacket on the left, raising my arm (and soaking wet); Goldwin is standing behind the women racers, on the far right. 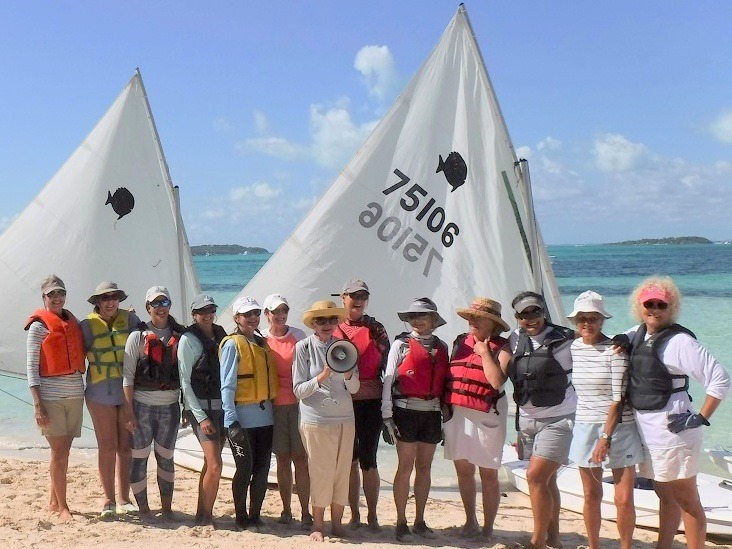 The race is named after Di Hunter, a long-time (former) Sunfish sailor, who sails her catamaran to Hope Town every winter from Massachusetts. 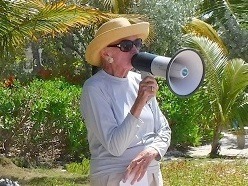 She’s 89. Wow, did I have exciting day. Turns out that falling into that beautiful turquoise water is actually fun; righting the boat was an adrenaline rush; and finishing n/w/s my capsize and loss of sail was super satisfying. How great is that — an amazing day. P.S. Pictures by Lorraine, Aletha and Carol. Way to go Nancy, very inspiring. Please write a book. Thanks. A breakthrough to step out of my competitive self and just have fun. Great Job Nancy! Glad you found an outlet for your competitive Spirit!